Quick note to the virtualization blog readers that our friend Rynardt Spies is experiencing technical difficulties while on vacation in South Africa. As a result, his popular virtualization blog www.virtualvcp.com may be unavailable until Saturday May 2nd. “I’m writing to try and get the word out the my blog www.virtualvcp.com is down. I’m on holiday in South Africa and it seems like there’s been a failure of some sort with my firewall. I’m unable to fix the problem until i’m back in the uk on Saturday, 2 may. Could you please just post this on your blog as there is now hundreds of hits a day that will get bounced and i have no way of communicating this to readers. Rynardt, don’t feel bad. I had the same thing happen to my website (along with a few others that I was hosting) when I went away on my honeymoon. 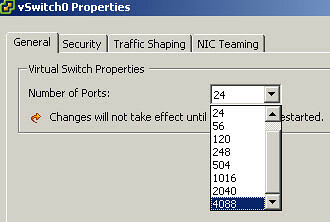 The gateway router had locked up and denied traffic to the sites until I returned. I’m not exactly sure where this document came from – I was unable to locate it on the internet, but it looks to have been generated by VMware for the partner or sales channels. I’m an end user so I typically don’t have my hands on sales material. 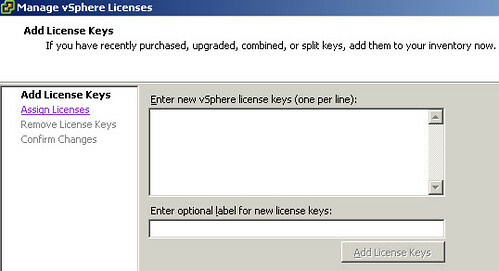 The document summarizes vSphere features, licensing, tiers, and more. It’s not marked VMware company confidential so I’m going to go ahead and post it. Hopefully I won’t find myself begging for forgiveness. 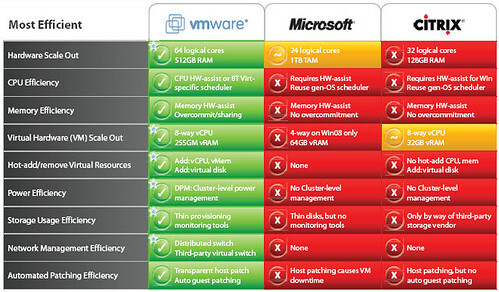 I love the virtualization product comparisons. There’s a lot of smoke in the air coming from all three major virtualization camps. 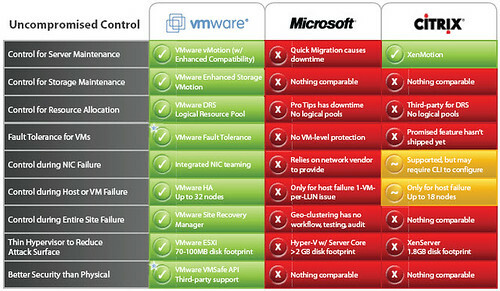 I think the product comparison charts really help answer the questions “Why VMware?” “Why not MS or Citrix?” “Is VMware’s price point worth it?” You bet it is. The data below speaks for itself. I woke up in this morning to two failed Veeam backups in my email inbox. 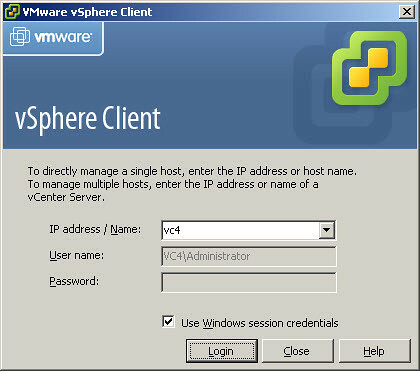 The two VMs were both templates I had recently created. I launched the Virtual Infrastructure Client to see if the VMs had an open snapshot which can cause Veeam backup jobs to fail (it’s a VMware issue, not really a Veeam issue). 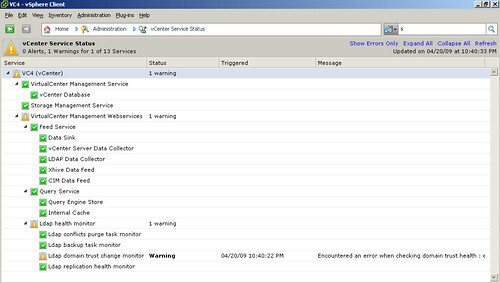 No snapshots, but the problem was immediately obvious: the VMs were shown as “disconnected“. 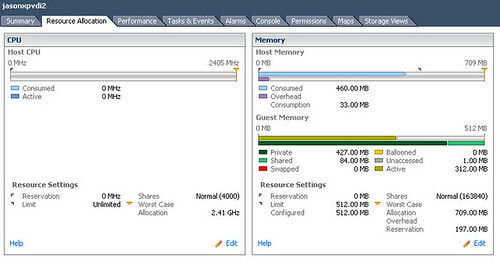 Typically a disconnected VM immediately ties back to a disconnected host. Not in this case. 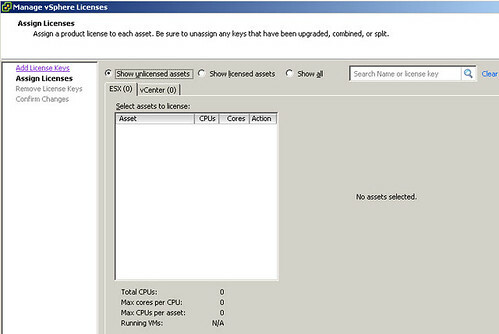 A quick look at the ESX host that was the owner of the VM showed that it was connected, online, and running powered on VMs. New territory. How to fix? Right clicking on the VM showed no option to re-“Connect” the VM. Right clicking showed no option to remove from inventory and re-register it. Hmm. Solution. 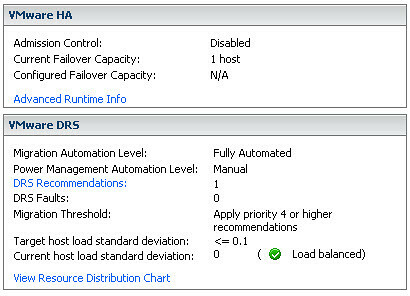 I placed the ESX host into maintenance mode which migrated off the running VMs to a different host in the cluster. The only two VMs left were the two disconnected templates. I then right clicked on the host and disconnected it. Immediately after being disconnected, I right clicked on the host and connected it. 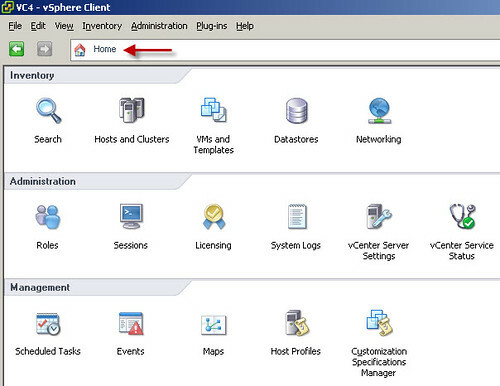 Both the host and VM templates changed from a disconnected to a connected state. Of course the final step was to remove the host from maintenance mode. 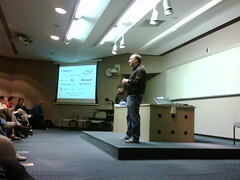 Today I attended Cloud Camp Minneapolis from 9:00am to 3:30pm on the University of Minnesota East Bank campus. I think the event was large success. Registration was SOLD OUT and it looked like there was somewhere between 100 and 150 attendees. I think it speaks well for the technology and the event organization when that many people will give up the majority of an absolutely gorgeous Saturday. The event started with a continental like breakfast where people mingled and socialized for an hour before the speaking agenda began. I ran into a few familiar faces and also met with new people I hadn’t met before. The coffee was strong and the bagels looked good. After breakfast, we were ushered into the main auditorium. George Reese (pictured top left), cloud book author and event organizer from enStratus Networks, kicked things off by briefly introducing himself as well as the premier sponsors: VISI, enStratus, Microsoft, Hosso The Rackspace Cloud, Aserver, and Right Scale. Shortly after, the Lightning Talks began. This is where the premier event sponsors were allowed just a few minutes to deliver their cloud speech along with a little product marketing while literally whipping through their slide deck. When I say just a few minutes, I literally mean it. I think five vendors all got up and delivered their presentations in a total of 15 minutes. If you’ve ever watched the television program “Mad Money”, it was like cloud talk and offerings during the lightning round. It was both an interesting and refreshing approach. Next we had a lengthy group discussion on hot cloud topics which were in turn used to dynamically develop the afternoon breakout session topics. We touched on things such as security, mobility, legal and liability implications, small business, etc. We broke for lunch where I had discussions with a few locals on phone, cable, and internet service providers (ISPs) in the state of Minnesota. After lunch the large group broke up into the smaller breakout sessions mentioned previously. I attended two sessions: Mobility and SMB. The mobility session had a good crowd mixture comprised of service providers, application developers, and CEOs. The discussions jumped from topic to topic as people offered up their problems, questions, and philosophies orbiting cloud mobility and isolation. Not to my surprise, there was very little along the lines of answers or solutions. That’s ok. I wasn’t expecting any. Frankly, I found comfort among large numbers of industry experts who, like I, didn’t have the answers and were just as perplexed about figuring out how this is all going to work out. Developers seemed to be the most concerned about the application layer (Applications as a Service) as discussions touched on APIs and applications in the cloud and their impact on development techniques as it applies to mobility. I got a sense of less concern over platform in the cloud, also known as Platform as a Service. One developer talked about his current experience of using Amazon’s Elastic Compute Cloud (EC2). His direct benefits: he owns and supports nothing, and he pays only for what he uses. When he’s not using it, there’s essentially little or no cost. When he’s done, I imagine he saves what he needs, and the rest is destroyed. There is no traditional decommissioning and writing off of assets. There is no hardware that needs to be disposed of properly. The SMB session was another good mixture of attendees nearly the same as above but with more of a concentration on small business, as well as micro and nano business (phrases coined during the session representing entities smaller than small business). The general idea of this session was if and how small businesses can benefit from cloud offerings. Talks began with the various ways to define a small business: by revenue? by headcount? by technology? There are examples of large manufacturing plants that have small technology footprints. Likewise, small operations can generate large amounts of revenue with the assistance of technology. Group members proposed that there exists many inefficiencies in small business, particularly in the technology and infrastructure. This is where renting platforms, applications, services, and infrastructure from cloud providers could make sense for SMBs. Wouldn’t small businesses rather focus their time and energy on developing their products and services instead of being tied down by the technology they need to run their business on? From a customer or partner credibility standpoint, does a business look more professional and equipped running their business in a certified cloud datacenter, or a broom closet? What impacts will regulation and legislation have? Decisions of how to securely store and deliver customer information in a small business shouldn’t be taken lightly. There are consequences that could easily break the trust and financial backing that a small business or startup’s survivability relies on. In all, I had a great time at Cloud Camp Minneapolis. If you asked me six months ago what I know about the cloud, I would have had nothing to say other than “I don’t get it”. I’ve gradually been warming up to the concept and today Cloud Camp Minneapolis went a long way in delivering my first feeling of personal and professional accomplishment in that I think I’m actually caught up and on the same page as many of my peers and higher experts in the cloud community. However, I have to be honest in saying that I walked away somewhat disappointed and in disbelief that virtualization discussion was nearly non-existent. The last two VMworld virtualization conferences I attended in Las Vegas and Cannes were strongly focused on cloud computing and VMware’s Virtual Datacenter OS (VDC-OS). There was maybe one mention of VMware in one sentence and a brief reference to VDI. Microsoft was on site talking about Azure and there was no mention of Hyper-V. No mention of XenServer, Virtual Iron, etc. 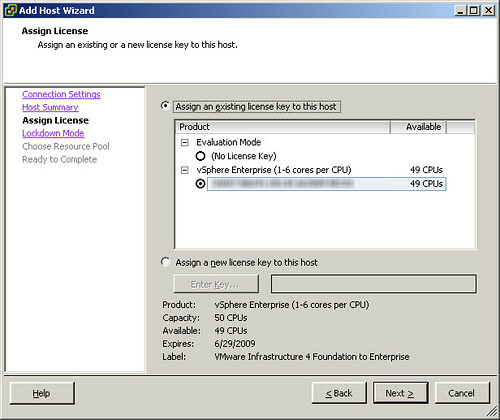 I’ve been led to understand that virtualization is key component to cloud infrastructure, applications, and mobility. I anticipated much of today’s discussions would revolve around virtuailzation. I couldn’t have been more wrong. After the event finished, I sent out a tweet re: no virtualization talk today. I received a response stating virtualization is merely a widget or one small component among many in the cloud. Virtualization is not really as integral as I’m being told by Paul Maritz of VMware. Maybe this is a case of Jason has been drinking too much VMware Kool-Aid for too long. The answers about the cloud are coming. Slowly but surely. Hopefully Paul is right and VMware does have a significant role to play in their version of global cloud computing. I’d like to see it, realize it, and experience it.